Are you a people pleaser? Do you feel guilty if you aren’t doing what others ask of you? Are you a natural born “helper”? Will you do anything for people to like you? Do you want to be known as a really “good” person? Is saying “no” REALLY, REALLY hard for you? Are you afraid doing so might hurt your relationships with others or affect how they think of you? Do you think that saying “no” – to have your needs be more important than helping others – somehow seems selfish? Are you a creative, spontaneous person who just LOVES to try new things and always has lots of projects going on at one time? Do you find yourself having difficulty finishing what you start? Do you take on more than you can handle? Is your plate often overloaded with things to do? Is saying “no” REALLY, REALLY hard for you? Are you afraid you’ll miss something if you turn down new and different things to do? Are you Ms./Mr. Super Human, seeing yourself as capable of taking on more than anyone else? Are you competitive and an over achiever? Do you have trouble admitting that maybe you are a normal human like everyone else who has limits? Are you afraid that doing so would project you as weak or incapable? Will you do anything to win? Are you afraid that if you don’t always lead the pack, somehow you’ll be lessened as the person you hope people think you are? When met with a challenge, is saying “no” REALLY, REALLY hard for you? Do you have to be perfect? Do you have to have everything just “so” and spend endless hours on getting everything right? Do you get caught up in the details and lose track of where you were originally headed? Do you have difficulty making decisions? Are you afraid that if you don’t try to be perfect or do perfect work, you might make a mistake or be seen as “wrong”? When asked to move on and not to get mired down in the details, do you find it REALLY, REALLY difficult to say “no” to those little things that you think have to be done to be “perfect”? Perhaps one of the reasons we have such a difficult time saying “no” is because we simply don’t take the time to identify what is truly important to us. In our personal lives, we don’t identify our priorities, the things that we absolutely must have to feel whole, complete, balanced, free, alive, joyful and peaceful. Or in a business situation, we don’t identify what is essential to do a job in excellence vs. perfection. To be successful in business it is sometimes critical to move quickly and there is no time, for everything to be perfect, nor is it necessary. 2) Say “no” immediately and clearly. If you know the “no” must be made, don’t delay, don’t put it off. There is no need to go into a lengthy explanation. Simply say “no”. 3) Explain why you are saying “no”. Be honest. Don’t avoid or beat around the bush. Just tell the truth as to why you are declining the request. Do it simply without any negative emotion. It takes courage to say “no” but do it kindly and with consideration. Be straightforward, calm and maintain an even voice. 4) Be attentive to your inclination to give to others at the expense of your own wants and needs. Explore possible alternatives that will create a win/win solution. 5) Sometimes you need to say “no” more than once, especially to people who are used to always hearing you say yes. They may not want to accept your answer at first. Let them know you are firm but do so with measured emotions. Be who you are. Be true to yourself. That is the best gift you could ever give to anyone and it’s the best way to take care of yourself. If you want to be admired and loved, give people an example of someone who respects their own wants and needs. If you are a person who takes on more than you can handle, get back in the driver’s seat of your life. If you are caught up in over achieving, saying “no” will give you balance that will bring health and well being back into your life. And if you have perfectionist tendencies, say “no” to your inclination to be perfect, lighten up and go with the flow, and remember . . .
Heroin, cocaine, alcohol . . .connected to the word “addict” conjures up images of back alleys, drunken driving, wild parties and orgies. But what if I say . . . cigarettes, coffee, food . . . or better yet, what if I list a set of beliefs and behaviors that limit, restrict and have control over us? Perhaps when we more carefully reflect, we begin to realize that almost everyone of us is an addict (one who is habitually and detrimentally controlled by something). Just as a substance abuser has difficulty putting down the alcohol, drugs and tobacco, so too do we have difficulty stopping the self-sabotaging beliefs and behaviors that hurt us and other people in our lives. Let’s take a look at some of the limiting and addictive beliefs and behaviors that affect our daily experience and keep us from being fully alive, productive, fulfilled human beings. On the list below, which ones do you hear yourself thinking/saying? What are your “favorites”? What are some other ones you know have a hold on you? Relationships never work . . .
All men are jerks . . .
Women just take advantage of a nice guy . . .
Employees are lazy . . .
Management doesn’t care . . .
I’m the only one who . . .
Or how about some behaviors? How many of these describe a behavior you frequently exhibit and that you sometimes unconsciously allow to dictate your actions and reactions? I could go on and on and I’m sure you can add many of your own to this list. These limiting beliefs and behaviors developed early on in our lives in an attempt to fit into, or make sense of our environment. We formed them to protect ourselves, mentally, emotionally, and sometimes physically. However, that was a long time ago. We no longer live in that same environment and yet we are still operating with the same survival strategies we formed when we were 3, 4 and 5 yrs. old. After much practice we soon became addicted to our opinions and judgments much like a substance abuser is addicted to a substance. Just as an alcoholic has trouble putting down the booze, so too do we have trouble stopping our self-destructive and limiting thoughts and actions. 3) Get a qualified coach to work with you and guide you through the process – someone who knows what questions to ask, give you the tools you want and who will challenge you when you need it. Essentially, life, living and learning is a constant process of being willing to shift and change. To be successful, you have to have to be willing to let go of the old ways and generate a clear commitment and courage to do what it takes to create a positive, joyful, successful life. Go for it! You can do it. The rewards are worth it. If the substance abusers can do it when there is an actual chemical dependency, so can you. Take one “addiction” at a time. Be good to yourself. Set yourself up to win and celebrate your successes. Your present weaknesses serve as opportunities to strengthen your will, your character, and personal success. Then write to my blog and tell me how you’re doing! 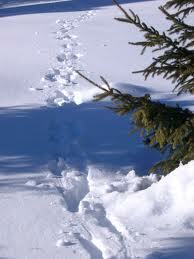 The tracks we leave behind each day are covered overnight.